From Almaty in the Central Asian republic of Kazakhstan comes a subway system that will be the envy of many of us for years to come. The system and its beautiful stations are a far cry from the imaginary country made famous by Sacha Baron Cohen’s entertaining, if tasteless movie, Borat. 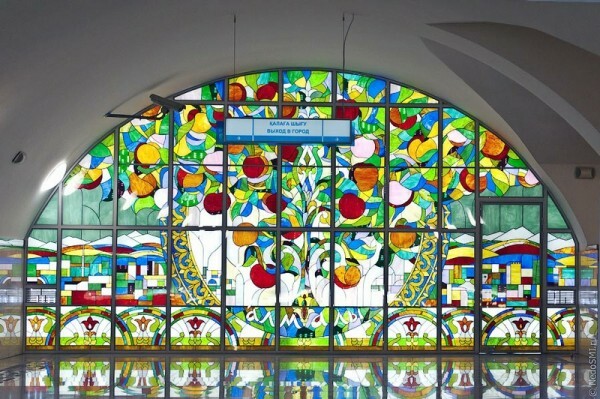 Some of the stations feature marble platforms, elaborate light fixtures and stained glass. In the face of more bad news nearly daily for California High-Speed Rail, Governor Jerry Brown is standing his ground, claiming that the train will create jobs, accommodate future population growth and aid the environment. Why? Political analysts say “Brown has his eye on history, trying to be mentioned favorably alongside his father, Pat Brown, who was governor from 1959 to 1967 and whose achievements virtually define modern California.” Can he do it? Stay tuned. Few people seem happy with the shape of the proposed City Council districts. For example, some residents of Koreatown are upset that their request to keep their community in one district has been ignored. Stay tuned for a vocal City Council meeting. Why not pick up President Obama’s old car on eBay? He must be parting with the gas guzzler because he is now either biking or taking the Washington Metro. At a starting bid of $1 million the auction is a little steep for my wallet. From our neighbor to the north comes news of a bike share program for Calgary arriving as soon as mid-2014. The new program will be a nice companion piece to the city’s expanded public transit system, though some critics are expressing concern that not enough on-street bike lanes will be ready by then. The House of Representatives is set to take up a five-year, $260 billion proposal on Thursday, February 2. Among other things the bill would fund the Federal Highway Administration and authorize the collection of the federal gas tax.